Security concerns are mounting in Rio de Janeiro as the city prepares for the pope's visit, after a riot in the upmarket beachside districts of Ipanema and Leblon continued into the early hours of Thursday. Despite pressure from the Brazilian authorities, Pope Francis will not use his armoured popemobile during his week-long visit. Instead, he will greet crowds along Copacabana beach and a Guaratiba outside Rio from one of two open-topped SUVs. Wednesday night's riot began as the latest in a series of demonstrations outside the house of Rio state governor Sérgio Cabral. Around 2,000 people were involved. Fighting broke out just before midnight and went on for two hours. Bank foyers, newsstands and public telephones were smashed, a shop looted and fires lit on residential streets. 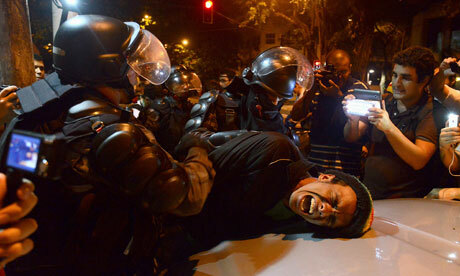 Police initially stood by because of an agreement with the Brazilian Lawyers Association (OAB), whose members accompany protests, and Amnesty International, not to use non-lethal weapons. "But what was agreed did not work out," Erir da Costa Filho, commander of Rio's military police, told a press conference on Thursday. Police then used water cannon, teargas and rubber bullets to disperse protesters, some of whom used anarchist insignia. The level of violence in the riot and the fact it took place in such renowned tourist areas shocked the city. At least six protests are planned during the papal visit – including one on Monday, when Pope Francis is due to meet President Dilma Rousseff, Governor Cabral and Rio mayor Eduardo Paes at the state government seat, the Guanabara Palace. General José Abreu, who is in charge of 14,300 army, air force and navy personnel drafted in to boost security for the visit, said on Thursday that demonstrators wearing masks would not be allowed into open-air events such as the Field of Faith – a two-day outdoor vigil and mass at Guaratiba – and may be expelled if they produce placards. Armed soldiers will be stationed nearby. He would not say if the military would be used to quell protests if they get out of hand. "We have an effective contingency that will remain quartered," he said. "We hope they will not be needed to do their job." "There are protests arranged, but it's difficult because they are going to use the army," said Vinicius Rodrigues, a physics student at the Federal University of Rio de Janeiro who has been involved with the protests since the beginning. Students are even planning to camp out by the military base at the Ilha de Governador where Pope Francis's plane is due to land on Monday, he said. A mass gay kiss is also planned for Monday. The Guanabara Palace has already seen confrontations between police and protesters, who have increasingly focused their anger on Cabral. Protestors want him impeached because of what they say are his links to big business and the heavy-handed police tactics used at previous demonstrations. An effigy of the governor was burnt at the Leblon protest. Rio de Janeiro security secretary, José Beltrame, whose house was also targetedin Wednesday's riot, as was a TV Globo building, said the police were still learning how to handle demonstrations. "We are learning in this process with things we don't know: molotov cocktails, people in masks," Beltrame said at a press conference on Thursday. Da Costa Filho said nobody knew who was behind the protests, in comments reported by the Folha de S.Paulo. He also said that riot control had not been part of police training for the last five years because Brazil does not have a recent history of violent disturbances.